I always color this house like it is some sort of stucco. Any other suggestions? Supplies: Stamps – Hero Arts, JustRite, paper – Neenah Classic Crest Solar White, Stampin’ Up! Close to Cocoa (retired), Soft Sky, inks – Copic BG0000, E11, E15, E19, E57, YG03, VersaFine Onyx Black, dies – Lawn Fawn, embossing powder – Filigree Fine Art Powder clear. Categories: card, new home | Tags: card, Copics, Hero Arts, Lawn Fawn, Neenah, Stampin' Up!, Tsukineko, VersaFine | Permalink. While I had my Hero Arts house on my workspace, I made a “townhouse” version of a new home card. Recently, Offspring3 and I went to the Kennedy Center to see the musical, “Chicago”. (thank you MUCHO, Offspring3!) We took the Metro (I don’t like driving in DC). The walk from the Foggy Bottom Metro station to the Kennedy Center was lovely. 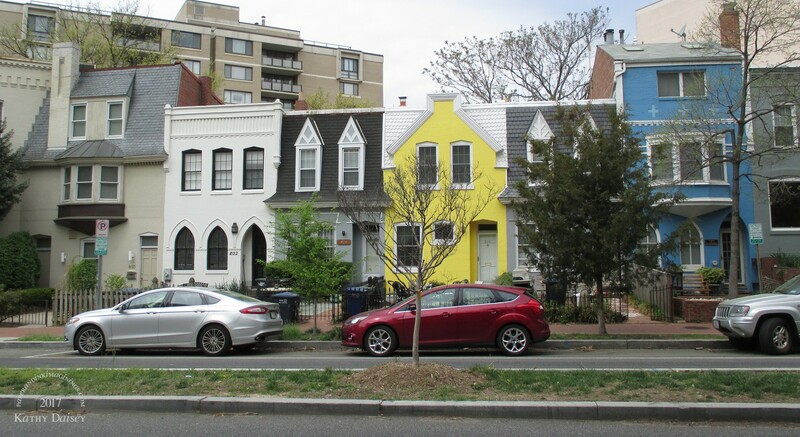 This row of houses was my inspiration for the card. Sorry about the wonky angle of the photo, I didn’t stop and square myself up directly across the street. Supplies: Stamps – Hero Arts, JustRite, paper – Neenah Classic Crest Solar White, Stampin’ Up! Bermuda Bay, Pool Party, inks – Stampin’ Up! Bermuda Bay, Pacific Point, Pool Party, Tempting Turquoise, die – Spellbinders, embossing powder – Filigree Fine Art Powder clear, metallic cord – PaperMart. 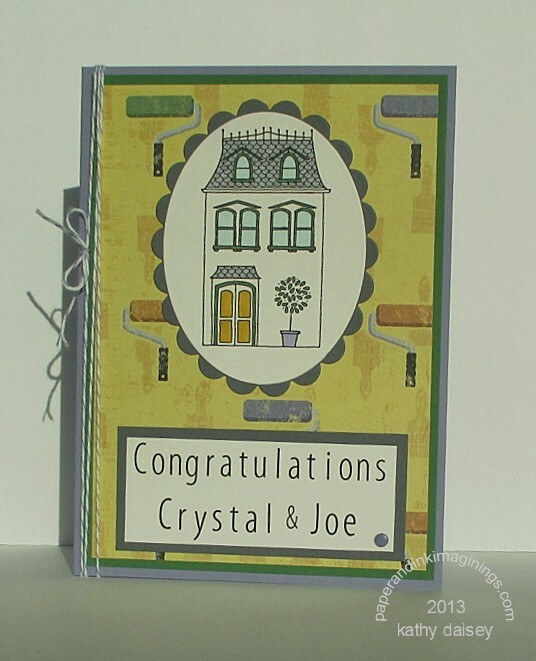 Categories: card, congratulations, new home | Tags: card, Hero Arts, JustRite, Neenah, PaperMart, Spellbinders, Stampin' Up!, Tsukineko, VersaFine | Permalink. 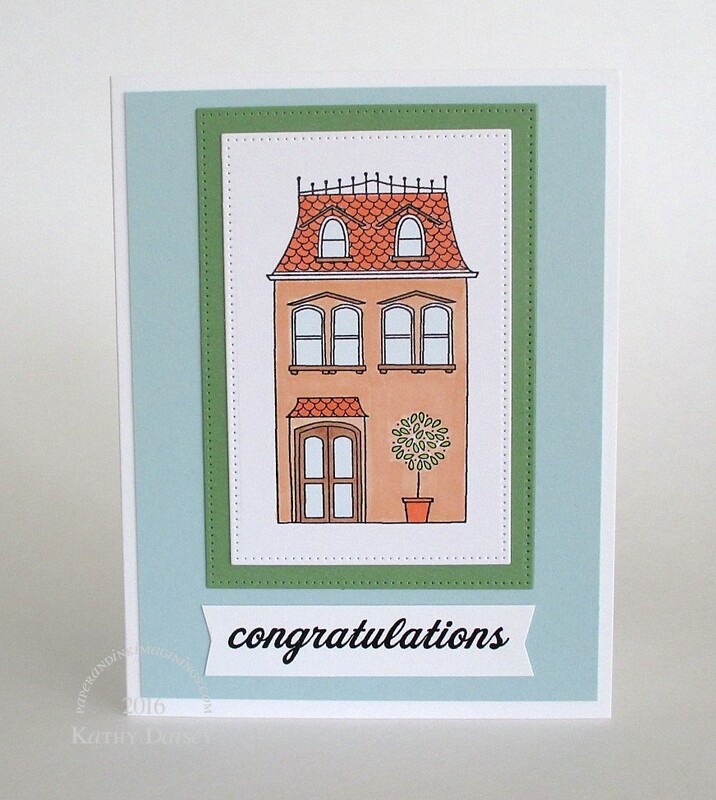 Just a nice “congrats on your new home” card. I started it with someone in mind, but then decided it was too formal for that person. Supplies: Stamps – Hero Arts, Papertrey Ink, paper – Neenah Classic Crest Solar White, Stampin’ Up! Soft Sky, Wild Wasabi, inks – Copic BG0000, E23, E53, R02, YG03, VersaFine Onyx Black, dies – My Favorite Things (pierced rectangles), embossing powder – Filigree Fine Art Powder clear. 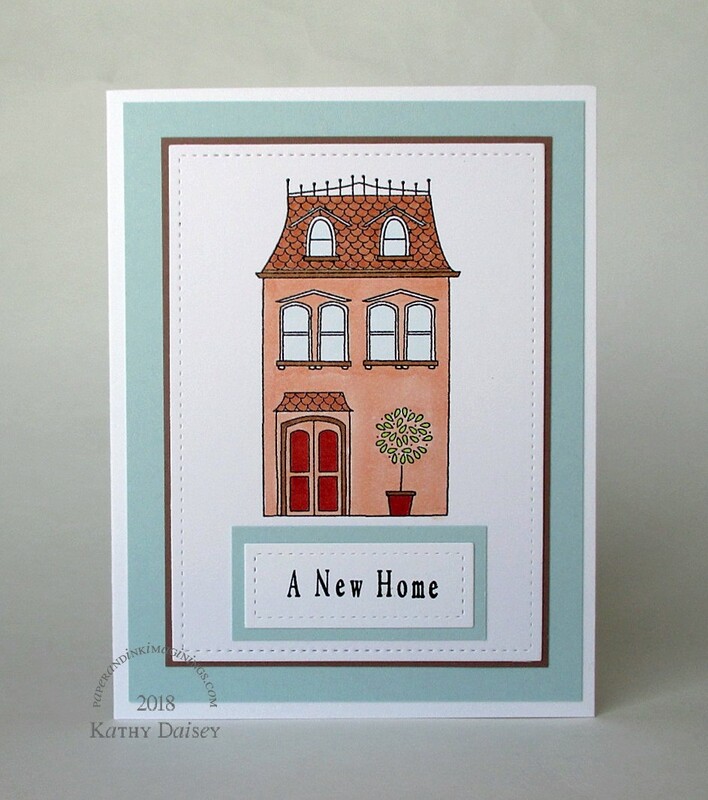 Categories: card, congratulations, new home | Tags: card, Copics, Hero Arts, My Favorite Things, Neenah, Papertrey Ink, Stampin' Up!, Tsukineko, VersaFine | Permalink. Another card requested by a friend. Restrictions – no blue, no bling. I found the paint roller paper at Photo Scraps, and, knowing the couple would be painting over LOTS of blue paint, thought it would pull the card together for me. Supplies: Stamps – Hero Arts, JustRite, paper – Karen Foster Designs Paint Rollers, Papertrey Ink Vintage Cream, Stampin’ Up! Basic Gray, Garden Green, Wisteria Wonder, inks – Copic B0000, BV01, C3, G46, Y26, VersaFine Onyx Black, dies – Spellbinders, enamel dot – Stampin’ Up!, embossing powder – Filigree Fine Art Powder clear, twine – Stampin’ Up!. 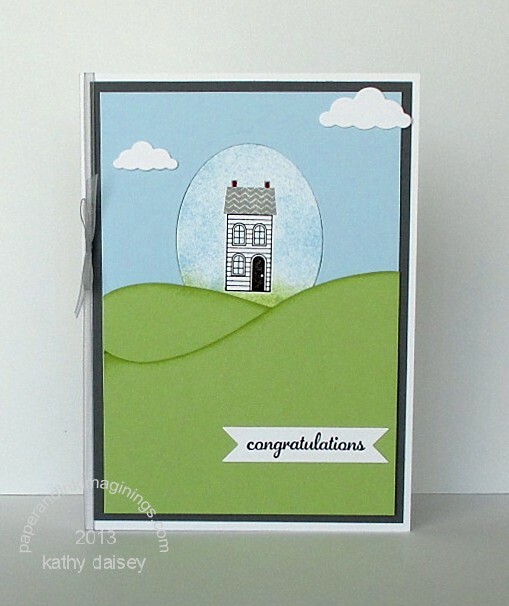 Categories: card, congratulations, new home | Tags: card, Copics, Hero Arts, JustRite, Papertrey Ink, Stampin' Up! | Permalink. I used a Koh-I-Noor French Curve template from my (old!) Engineering Graphics supply pouch to create the curves that became the rolling hills. Supplies: Stamps – Stampin’ Up!, paper – Papertrey Ink White, Stampin’ Up! Bashful Blue (retired), Basic Gray, Certainly Celery (retired), inks – Copic R89, Stampin’ Up! Bashful Blue (retired), Certainly Celery (retired), Smoky Slate, VersaFine Onyx Black, dies – Memory Box (clouds), Spellbinders (oval), Stampin’ Up! (banner), embossing powder – Filigree Fine Art Powder, organdy ribbon – ClearBags. 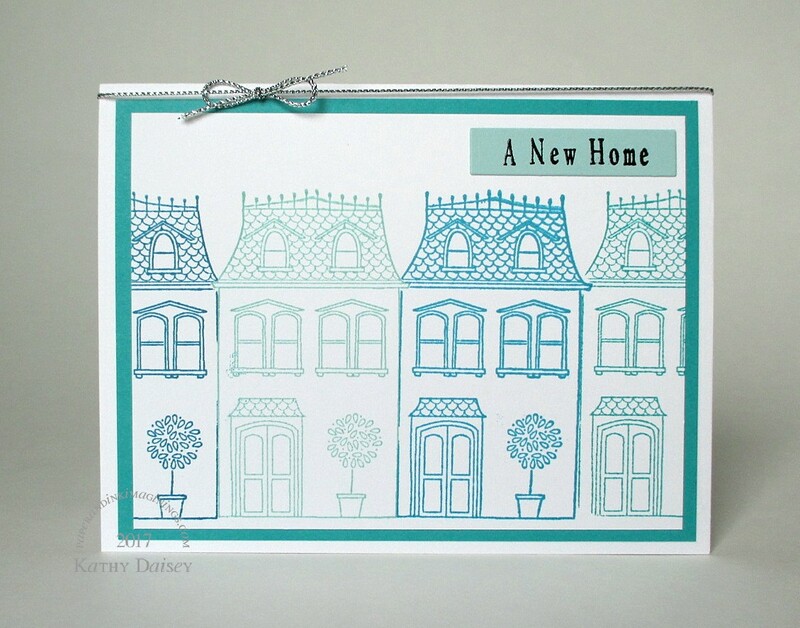 Categories: card, congratulations, new home | Tags: card, Papertrey Ink, Spellbinders, Stampin' Up! | Permalink. We moved into our house 18 years ago, with a 2 year old and a bun in the oven. My neighbors across the cul-de-sac had been in their house about 8 months when we moved in, their children were in 2nd, 5th and 8th grades. Fast forward to TODAY…our neighbors have sold their house and are moving into a new home. Their children (all grown & married) and grandchildren (SEVEN!) all signed this card. Sigh. My neighbor had said we communicate mostly by e-mail now anyway (true – we are both running all the time). At least our cyber connection will remain! It will be strange to not be able to “escape” to her house for 15 minutes when someone in my house has pushed one of my buttons! I really can’t wait to see their new home!! Supplies: Stamp – Hero Arts, paper – Michael’s glitter paper, Papertrey Ink White, Stampin’ Up! Night of Navy, Pool Party, Smoky Slate, Taken With Teal (retired), inks – Copic B0000, C1, C3, YG25, VersaFine Onyx Black, embossing folder – Provo Craft, dies – Spellbinders, embossing powder – Filigree Fine Art Powder clear, crystals – A Muse Twinkle Stickers, computer generated sentiment. Categories: card, new home | Tags: A Muse Artstamps, card, Copics, Hero Arts, Papertrey Ink, Provo Craft, Spellbinders, Stampin' Up! | Permalink.